It might seem like a superfluous point but are all your website sections completed? Are all text and title areas adequately filled with your own work? It might be difficult at first glance to see if all sections have been personalized. Look for all the ‘’I am a paragraph’’ or ‘’I am a title’’ on each page. Click then on the eye icon located top right to switch to preview mode. It will help you check if nothing is missing and if everything has been completed correctly. Your visitors will certainly prefer a complete and finished website because it will look more professional. Moreover, since we are in the verification process, take a few minutes to test all your website’s links and buttons in order to make sure they send your visitors to the right place. To do so, go on the editor and do a right click on each button or link to inspect. You must have completed the rectangle with a website address to be valid. You can also modify the text of the button; we suggest you use call-to-actions words. Finally, has your contact form been personalized with your own information? No? Here’s how to do it: do a right click on the form and modify it according to your needs. 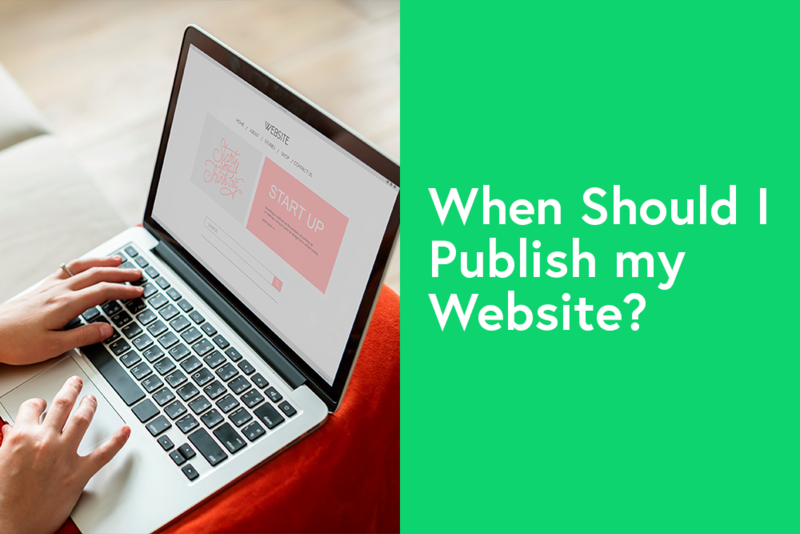 It is very likely that if you feel like publishing your website it is because you like it. Did you, however, take the time to show it to friends or family to have constructive feedback? You can send them the overview without having to publish your website. When we work many hours on the same project, you might walk by some important elements. It might be difficult to show your work to others and be exposed to criticism; nonetheless, it is often for the best. An outside view can help you see mistakes or weaknesses. It is also a great opportunity to learn about what your visitors will like and make necessary changes before launching if needed. After you had feedback from your relatives and have checked all sections, there is the most important point: do you like what you created? Are you proud or do you feel like that something is wrong? Do not forget that perfection can kill creativity; therefore, know when to stop. Moreover, if you change your mind with time or want to make modifications, it is good to know that you can go back to the editor. You can make changes even if your website has been published. Listen to your instincts and your heart, if they tell you that your work is satisfactory, consider seriously to publish your website. In order to let you have the best reach possible, you should think about preparing the launch. Did you, for example, announce your project on social media a few days before to gain the interest of your relatives and potential visitors? Or have you only created a Facebook page related to your website? Do not underestimate the importance of social media to help your website. Do any of your articles or products could interest other bloggers or YouTubers? Take the time to look for compelling partners to assure you great visibility. Are you now ready to leap? Has everything been checked and worked as you want? There is then only one thing left: click on the blue button located top right of your editor. As mentioned above, it is always possible to make changes, even if your website has already been published. Do not forget to read our articles and tips on the WebSelf blog to always be up to date! Our team wishes you a lot of success, do not hesitate to show us your website!